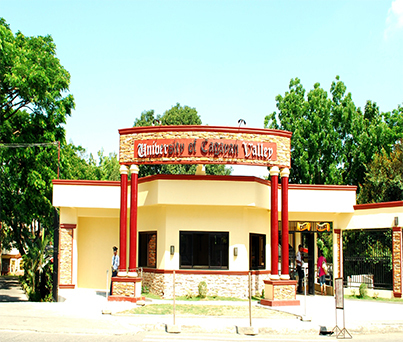 The University of Cagayan Valley (UCV), formerly known as the Cagayan Colleges Tuguegarao (CCT) and Cagayan Teachers College (CTC), was founded in April 1948, from the rubbles and devastating aftermath of World War II. The country was still in economic chaos; most schools have been destroyed or burned and were being rebuilt and rehabilitated. There was a dearth of teachers all over the country and people were just getting over their travails and horrifying experiences during the war. Tuguegarao was not spared by the war. The Japanese forces were everywhere. In fact, the Japanese Army had a large contingent quartered in the Old Selecta Ladies Dormitory owned and operated by the late Doña Caridad S. Ventura-Perez, located at the site now occupied by the Dr. Matias Ponce Perez, Sr. Building commonly known as the CCT Main Building. As a result of the bombings of American forces to destroy enemy installations, the Old Selecta as well as the whole “Centro” of Tuguegarao was reduced to ashes and only few buildings were left standing after the war. It was during the long war years while on evacuation that Atty. Matias Ponce Perez Sr. concretized his life-long dream and promise to the Cagayan electorate in the early 30’s of founding a school which can offer affordable higher education. At that time, there were no institutions of higher learning in Tuguegarao nor in nearby areas, that one had to go to Manila to obtain a college education. Atty. Perez had a great foresight. He had foreseen that after the war, there would be a great need for more schools, for better trained and more qualified teachers. During that period, even teachers in the public school needed to grow professionally as many of them were just high school or secondary normal college graduates. Thus, in April 1948, with the help of his friends, relatives and some public school officials, and with the inspiration and guidance of his wife, Mrs. Caridad S. Ventura-Perez, the Cagayan Colleges Tuguegarao formerly CTC, now UCV was born. The Cagayan Teachers College now University of Cagayan Valley started modestly. Its course offerings during its first year of academic operation (1948-49) were limited to Elementary Teacher’s Certificate and Bachelor of Science in Education. Soon after, other courses were offered. Because it was felt that the old name of the Institution, “Cagayan Teachers College” was already a misnomer, considering the fact that the Institution has begun to offer courses other than teaching, the Board of Trustees in 1983 amended Article II of the original Articles of Incorporation to change the Institution’s name to Cagayan Colleges Tuguegarao. Hand in hand with the Institution’s academic expansion, its physical facilities and structures are also being improved and expanded. To accommodate the growing number of enrollees, the Institution maintains two campuses; the College Avenue Campus where the Dr. Matias P. Perez Building is located, and the Balzain Campus with an area of some eight hectares where the other buildings of the Institution are located. The Dr. Matias P. Perez Building, complete with science laboratories and a simulated hospital, quarters the College of Health while the various buildings at the Balzain Campus house the Colleges of Law, College of Marine Engineering, College of Marine Transportation, College of Technology, College of Engineering, College of Computer Engineering and Information Technology, College of Hotel and Restaurant Management, School of Arts and Sciences and Teacher Education, School of Business Education, School of Criminology and Graduate School. It is also in the Balzain Campus where the Computer Laboratories, Swimming Pool, Mock Ship, Crime Laboratory, Chemistry, Biology and Physics Laboratories, Maritime Laboratories, Technology Laboratories, Engineering Laboratories, Dark Room, Interrogation Room, and the Gymnasium are housed. In 2002, the Institution was deputized by Commission on Higher Education (CHED) to offer the Expanded Tertiary Education Equivalency and Accreditation Program (ETEEAP) under the BS Criminology Program.. The Institution was also designated by the Technical Education and Skills Development Authority (TESDA) as the Assessment Center for Computer Hardware Servicing NCII and venue for Skills Assessment in Housekeeping NCII and Automotive Servicing NCII. The College of Maritime Education which offers Bachelor of Science in Marine Engineering and Bachelor of Science in Marine Transportation is [ISO 9001] Certified by DNV (Det Norske Veritas) Norway. On the other hand, the Institution’s, Liberal Arts, Teacher Education, Business Administration and Criminology Programs are Philippine Association of Colleges and Universities Commission on Accreditation (PACUCOA) accredited. The Hotel and Restaurant Management and Technology Programs have likewise passed the PACUCOA consultancy visit and were granted candidate status. In response to the demand of its stakeholders and the medical field, the Institution opened the College of Health with two programs namely, Bachelor of Science in Nursing and Graduate Diploma in Midwifery in 2004. The Institution has the following curricular offerings: two (2) Doctorate Degrees, four (4) Master’s Degrees, twenty one (21) Baccalaureate Degrees, two (2) Post Baccalaureate Degrees, six (6) Pre-Baccalaureate Degrees, two (2) Post Secondary Technical Courses, Complete Secondary Level, and Complete Elementary Level (K-12). It also offers two (2) Terminal Programs. All in all, UCV has twenty-nine (29) Recognized Programs and eight (8) Registered Certificate Programs. With the belief that the institution has the capabilities of becoming a university as shown by the results of the series of accreditations conducted by PACUCOA and with its exemplary performances in Research, Community Extension and Instruction, the Board of Trustees and the management of UCV, through the commitment and dedication of its officials who led the whole workforce, were inspired to submit its intention for university status. In 2008, pertinent documents for this purpose were submitted to CHED Central Office through the Regional Office. From that time on, the desire had been nurtured and sustained, until finally CHED Central Office came to evaluate whether the request was due for merit. All members of the team who came were impressed. Their recommendations were all faithfully carried out. On July 8-10, the CHED Commissioners had come to validate all that the earlier team had reported about CCT’s readiness for the university status. Truly after many challenges & hard work, the status was awarded to CCT through Resolution No.186-2010 dated July 14, 2010 of the Commission en banc which changed the name Cagayan Colleges Tuguegarao to University of Cagayan Valley. On July 19, 2010, with the University Status Certificate on hand “The First University Assembly” was held attended by students, faculty, administration, personnel, alumni, CHED officials, religions group & friends of UCV. On September 15, 2010, Dr. Victor V. Perez, in an investiture program, was installed as the first university president. To sustain its university status and to keep abreast with global requirements, the University in 2013 put-up a four-storey laboratory building to meet the growing needs of its clientele. On July 24, 2014, the University launched its intention to be certified for International Standard Organization (ISO) 9001:2008 Quality Management System with British Standard Institution (BSI). Through painstaking challenges and hard work, BSi finally issued on October 07, 2015, its Certificate of Registration on ISO 9001-2008 Quality Management System with Certificate No. FS 636133 to the University of Cagayan Valley.